The United States Air Force Global Strike Command (AFGSC), tasked with developing and providing combat-ready forces for strategic deterrence and global strike operations, uses GIS in many ways, from mapping critical facilities to providing situational awareness in emergency management response to overseeing infrastructure management. AFGSC controls all Air Force nuclear bombers, missiles, and more than 31,000 personnel. This arsenal includes two-thirds of the United States’ nuclear armament capabilities. Critical nuclear facilities are mapped for operational and strategic decision-making purposes. The US Air Force (USAF) GeoBase mapping platform was implemented more than 15 years ago. ArcGIS is deployed at the USAF GeoBase offices and provides analytical mapping support and maintains standard and custom web applications designed to sustain the specific missions of individual bases and the groups attached to those bases. In an emergency, a base response team may require a web application that specifies the incident location, current route conditions, and directions to nearby hospitals. For the same emergency, the security forces group will need the identical response team intelligence, but its app will also include digital elevation models, locations of limited visibility in the response area, and standard weapon locations. The geospatial software architecture is consistent at each GeoBase office. All GeoBase work adheres to the Spatial Data Standards for Facilities, Infrastructure, and Environment (SDSFIE), which was adopted by Defense Installation Spatial Data Infrastructure in 2006 to provide standards for the US Department of Defense. 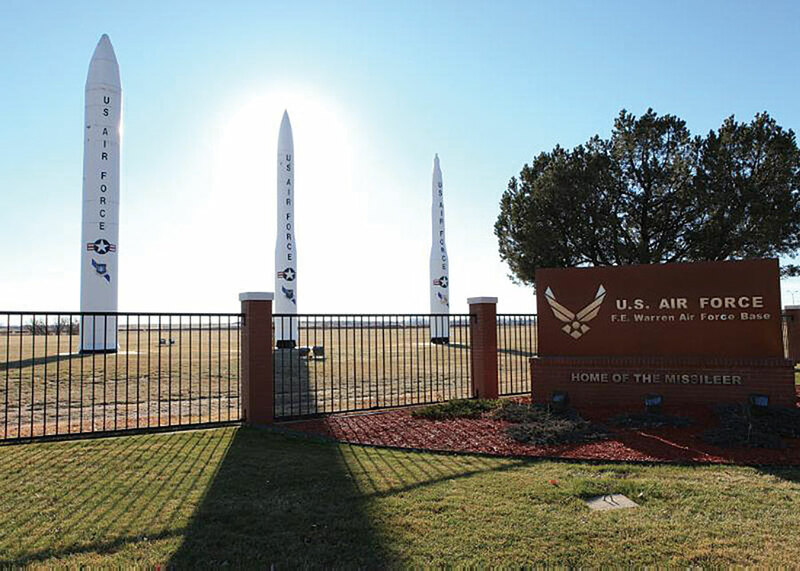 At Warren AFB, the 90th Missile Wing currently runs more than 100 services and supports 16 web editor and viewer applications that incorporate real-time intelligence, routing, security, and data migration and standardization applications. First responders provide the initial reports of the incident. Their information is plotted in the web application to show management teams in the affected area. Data is updated continuously in real time and disseminated through the application to other teams such as security forces battle staff and tactical response force. After it is compiled, this information is shared with local and federal law enforcement, fire crews, and emergency medical technicians involved in the response. Internal sources provide data on traffic control, evacuation zones, safe routes, affected facilities, locations of response personnel, civilian monitoring, and contingency operations. External data sources allow incident commanders to monitor chemical, biological, radiological, nuclear, and high explosives and incorporate publicly available datasets. “The combination of this data, through the functionality of the ArcGIS platform, is key to providing incident commanders with situational awareness in an emergency scenario,” said Bushell. All construction and maintenance of base infrastructure must be closely monitored at the historic Warren AFB, the oldest continuously active military installation and a designated National Historic Landmark. To preserve the base, AFGSC commissioned the development of a web mapping application for GeoBase that is used by wing planners, engineers, archaeologists, and others, to identify areas where potential new construction and sensitive areas of cultural, environmental, and historical significance overlap. The application tracks excavation permits on base and coordinates with municipal power and communications organizations. Through a single web viewer, it identifies all critical data layers and ensures the entire organization is on the same page throughout the process. This is particularly important because the US Air Force and the State of Wyoming are currently working together to renovate a nearby Missile Alert Facility (MAF) and open it as a public attraction in 2019. The site was part of the Cold War era intercontinental ballistic missile (ICBM) program that housed MX nuclear missiles, commonly known as Peacekeepers, until it was deactivated in 2005. For additional stories about the US Air Force’s GeoBase program, see “Innovative Strategy for Facility Upgrading” in the Fall 2011 issue of ArcUser and “Where’s the Trash?” in the July–September 2005 issue of ArcUser. The opinions contained herein are those of Esri and contributors to this article and in no way represent an official statement or endorsement from the US Air Force.